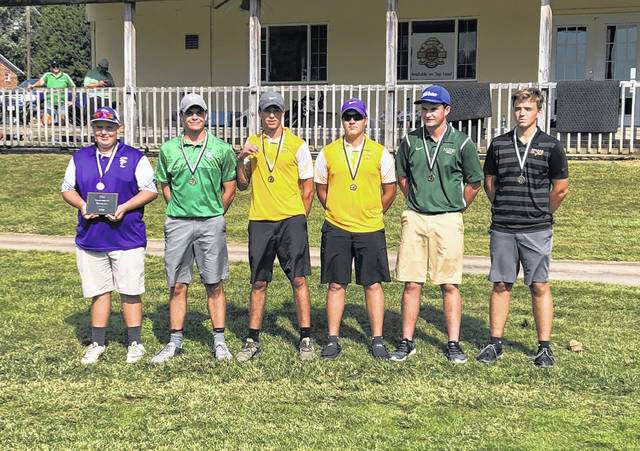 Earning first team honors at the second annual TVC Hocking golf invitational, standing left to right, are Miller’s Hunter Dutiel, Waterford’s Wes Jenkins, Southern’s Jarrett Hupp and Jensen Anderson, Eastern’s Ryan Harbour, and Belpre’s Eric Dotson. MINERAL WELLS, W.Va. — Twice as nice. 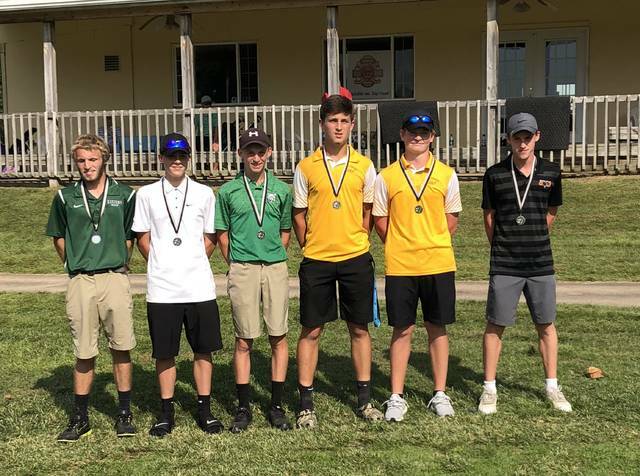 The Southern boys golf team earned its second consecutive Tri-Valley Conference Hocking Division Invitational championship as they posted a 30-stroke victory in the 18-hole match on Friday at Woodridge Golf Club in Wood County. The Tornadoes compiled a 329, with the teams playing up to six golfers and counting the four best scores. Belpre placed second with a 359, while Eastern finished third with a 361. Waterford was fourth with a 363, while Miller placed fifth with a 380 and Federal Hocking earned sixth with a 380. Wahama was seventh with a 433. South Gallia who competed with only three golfers finished with a total of 387, but did qualify for final team standings. The top-six golfers on the day earned first team all-tournament honors, while the next six were named second team all-tournament. Southern landed three first team golfers and two second teamers, while Eastern had one golfer on first team and one golfer on second. The Tornadoes were led by Jarrett Hupp with a 75, while Jensen Andersen was next with an 80. Ryan Acree and Landen Hill followed for the Purple and Gold each firing an 82, resepectively. The non-counting rounds for SHS were a 93 by Joey Weaver and Will Wickline’s 97. Eastern was led by Ryan Harbour who shot an 83, while Josiah Brewer was next with an 85. Josh Harris was net for EHS with a 93 and Nick Durst followed with a 100. Not counting toward the Eagles team score was Ethan Short with a 115. Wahama was led by Ethan Mitchell with a 99, as Gage Smith was next with a 108. Ty White followed with each fired 110, while Issac Roush’s 116 rounded out the top-four for the White Falcons. Not counting toward Wahama’s team score was Khyer Bush’s 117 and Casey Greer with a 119. The Rebels were paced by Noah Spurlock with a 109. South Gallia’s other two non-counting rounds were Nolan Stanley’s 138 and Sam Cudd’s 140. The victory for Southern follows their seven-stroke victory at the inaugural Tri Valley Conference Hocking Division Invitational on Sep. 18, 2017.